Hello, Autumn Get Crafty is here!! 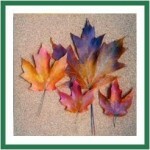 This week’s post is all about wonderful Autumn Crafts! As Christmas Get Crafty muscled its way in early, this is a little late. 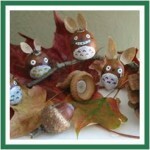 This does however mean, that I have had LOTS of wonderful autumn crafts to look at and feature for you today! 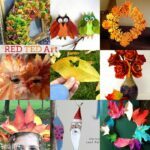 As always, I DO hope you enjoy browsing and that you find some autumn crafts to be inspired by! So many lovely things. As always, do show your appreciation, by clicking through to the crafters in question! They will be very happy about your visit! Very simple. Anything white and anything sparkly goes. Doesn’t have to be wintery, though of course we can celebrate the best of winter, such as snowmen and angels. Get out there. Get Crafty. Come back. Submit by Friday 26 November 2010. 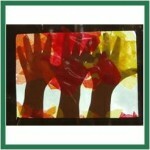 Don’t forgot that you can also link up WEEKLY for KIDS GET CRAFTY every Wednesday. MJM at MetaJugglamum is a “new” friend of mine that I met through all the other wonderful blogger ladies on twitter. What I love about her, is that she is laid back, likes to have fun and to craft with stuff around the house. My kind of lady. 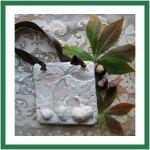 And lucky for me, she has recently started posting more of her crafts on her blog. I adore her cute cute cute Autumn Dragon here. 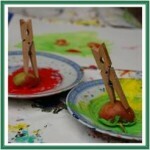 So cute and so easy and will impress any child (or adult that is a child at heart). And it simply sums up Autumn in one craft for me! When I first saw these, I experienced the most bizarre emotion: Loo Roll envy?! Ahem, yes, I know, I am ridiculously weird. 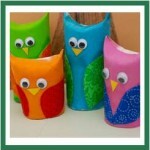 But I adore Loo Roll crafts and I only “wish” I had invented these GORGEOUS Loo Roll Owls, but I didn’t. So instead, I will bring you the fabulous Valerie at Frugal Family Fun Blog once again! She really is a tip top crafter! Now, do go and make some, whilst I hide in a dark room with my loo rolls to come up with something equally fab! 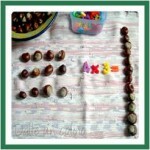 I like Meni’s idea to do some maths with conkers (chestnuts). When I was small, I remember collecting shoe boxes full – far too many for making horses and animals! So this is a fabulous way to play with those ever so tactile conkers and improve your maths skills whilst you are at it. Here she has multiplication and her she has counting and adding. Lots of handprint trees around, but I just love the effect that this tree window has. It just looks magical and I can just imagine the child hands… as well as having the sun shine through the leaves (you will see that I love sunshine through leaves with my “Fall Photo” here), I don’t know what else to say, except that I love it! If you read my blog regularly, you will have seen these already. But I do like to “remind” People of posts pasts… so here some super duper easy Stick Men. And if Stick Men don’t do it for you, maybe Leaf Men do?! Equally simple. Equally fun! How amazing Google Eyes are! 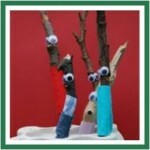 Oooh and if you want some more traditional stick men.. see these ones here – so cute and colourful! Check out how from our Scandinavian friends at Forskoleburken. 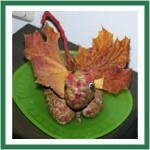 Meni has SO many wonderful autumn crafts on her blog, you must go and take a look. It was really hard to just pick a couple. But in the end I went with the one that made me smile the most – I love these leaf pictures. It feels like doodling with nature and then eternalising them by taking these wonderful photos. Isn’t the bat just too crafty? And how fun is the leaf umbrella? Go take a look at all the fun! Cathy a Nurture Store also, has some lovely ones for you here. Oh how lovely! 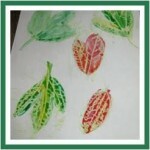 Leaf rubbings AND watercolouring: I have done leaf rubbing, but not added the watercolor before. That looks sooo effective. Red Ted can’t do leaf rubbings yet (we tried a couple of weeks back), but when he can, we’ll do this! 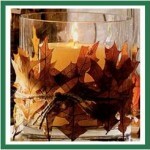 This is a really nice way of adding to colours to your autumn crafts and making the overall effect really spectacular! Go see Elizabeth and see how they did it! 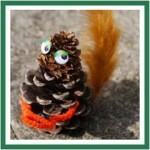 Another Pine Cone cutie! I not only love the “craft”, but the fact that Chris and her brood “released” this squirrel from its pine cone state. Read how they found all these different creatures and be inspired to go find your own! Everyone knows that at this time of year you MUST do apple prints. We found it all a bit tricky and sticky untile we came up with the idea to use clothepegs as a handle. Come check out Red Ted’s Apple Trees. 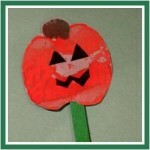 If you now want to give Apple Printing a go here is a neat idea of what you can make with it: Some Pumpkin Lollipop. Very cute! Cathy at Nurturestore made these with her girls! I know that at the time of posting Hallowen is well and truly over, but you may still have a party to go to or you may still feel like getting all spookily crafty! Like Maria at Fab Mums who made her own spooky Goodie Bags. Go and have a look! 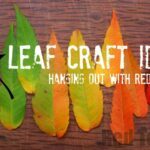 Not only is this a lovely craft activity – making leaves and an autumn tree – but what I love about this tree, is that each leaf has an activity written on the back – a great way to create family fun and activities for all to enjoy. Very sweet. Go visit Little Wonderdays for more info. Ok, so I do have a couple of Loo Roll creatures up my sleeve. 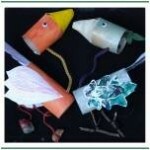 Come and use your Leaf Prints or Leaf rubbings and make these 100% recycled/ scavanged Marionnette birds! Oooh. Oooh. Oooh. 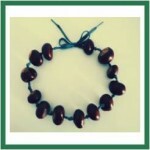 Abby at little Red Buttons made this Conker Necklace for her kids, but I would wear this!! I would. V cool. Make one. (I now “just” need to find enough conkers… don’t seem to be any round our way). The one thing that is a real shame about Autumn leaves, is how they curl up and become brittle so very very quickly! 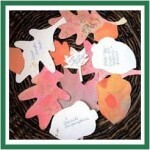 So when I so Little Wonder Days post about how to preserve them, I knew this had to go into Autumn Get Crafty! 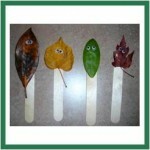 It is easier than you think and imagine making some of your leaf crafts with preserved leaves?! They would last so much longer! Fabulous! Sorry, this one is “just” a photo, that I “found”, no instructions or comments, but it is so cute, I wanted to share it with you… For slightly older kids, as you need to do some “fine painting”. Take a look at the big photo here. I told you that my new best friend MJM from Metajuglamum is a crafty old so and so… here she has this adorable little conkers snake. Hssssss. 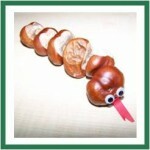 We do still have some conkers knocking about and if they are not too hard yet, I will make a snake for Red Ted! Lesley at My Mommy Makes It created these fabulous botanical plaster casts – a great way to explore nature together. 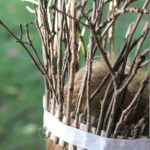 Take a peak at her post and learn how you can teach all sorts of things to your children whilst you are collecting and crafting! Well, I think these masks are for children OR adults. Imagine going to a fancy dress party or ball (as an adult) with one of these most amazing masks. I LIKE VERY MUCH! 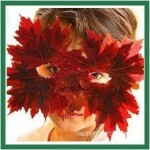 Hope over and check out free mask downloadables. Lovely indeed. Apparently you can make these with kids! I think they look fabulous and make for very pretty decoration, be it on the mantle piece or hangin from some branches in a vase. See how easy they really are to make here. Another feature from Red Ted Art. 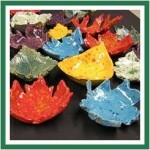 These leaf bowls were originally made in a kiln, but use air drying clay and have a go at home. Click here for instructions. 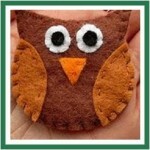 Cute little Owl Brooch tutorial. 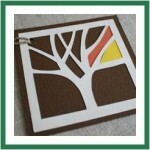 Why stop at brooches, use them as tree decors, add magnets for fridges – your imagination is the limit. Aren’t they jus a hoot (sorry, couldn’t resist!). 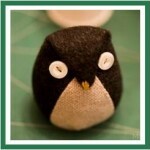 Ok, these are “just” owls… but they are so cute and you have a tutorial here as to how to make them. I adore these. I think I will make one for all my friends and then a great big fat one as a doorstop. Go visit Moon Stitches for a great tutorial. Here some Autumn coziness with this wonderful leaf bowl. Doesn’t it just make you want to snuggle up on the sofa with a good book and a glass of wine or hot cup of cocoa? 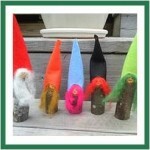 Check out how easy they are to make! 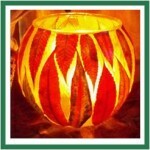 If you don’t want to use a bowl, why not decorate the candle itself. 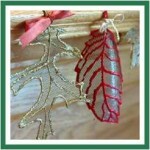 Would you believe the leaves are simply glued on? Very easy. Read how, here. 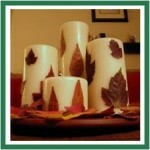 Or….. simply decorate vase with, easy to remove leaves. I think this looks wonderfully rustic and could equally look great with some twigs. More info, here. A little video tutorial shows you how to make this gift tag! Gift tag??? Pffft, this is so cute you can put in your wall!! Or use it for a greeting card!!! Love it! This mushroom city is so cute and guess what, it fits perfectly into my “recycled mantra” (shoot, I should have saved these for recycled Get Crafty). 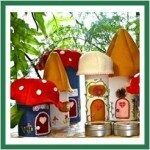 They are made from old jars and bits and bobs and are for keeping mummy’s craft things in one place. But I am sorry, what little girl will be able to resist stashing away her secrets in here? Truly adorable. Oh these are perfect for a spooky bonfire night! You see here “Apple Heads”, that become SHRUNKEN HEADS that you get to roast over the bonfire. Come on, which 8yrs old boy wouldn’t LOVE this as an activity!? Go and take a look and read about the yummy cinnamon and sugar coating too! 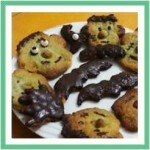 I feel as if I have given Halloween a miss.. but mainly because, this post is going live AFTER Halloween… but in order to not be a ba humbug, I did want to share Maria’s Frankenstein cookies over at Fab Mums. 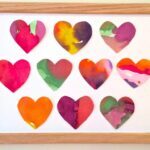 Maria is a lovely regular contributor to my Kids Get Crafty link up and has wonderfully creative and recycled craft ideas. You really must go and see her blog!! I was beginning to wonder if there was going to be much “Oooh” (or Get Crafty in the Kitchen) this autumn, when I stumbled across this radish salad… it really did make me smile! 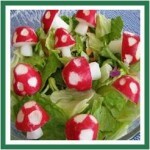 Not sure if I would have the patience to make this, just to be eaten in a short time, but they look SO adorable. Mmmh. Maybe I WILL have a go…. 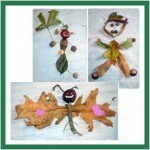 I hope you have enjoyed our selection of Autumn Crafts and do have a go!!! Oh Maggy, thanks for featured me and thanks for your lovely wishes. Tiffany: Oh! NEVER EVER throw away Loo Rolls!!! 😉 Too many things to make! The acorn creatures are actually Totoros (Asian dust bunnies) that collect acorns and serve as nature spirits to protect trees and young children. My child is watching My Neighbor Totoro right now as I write, best movie ever made for kids. 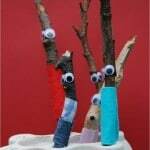 I plan on knitting and felting a few of these for Christmas presents. How perfect to make them of acorns. Thank you for featuring two of our autumn projects. I think you picked my favorites. I love so many of the projects and blogs you featured. I’m hoping we have time to do a few of them. Ditto Fabmums… there is definitely enough here to keep us all busy!!! Ooh Lesley, thank you for the heads up on the Totoros – how lovely that they are protective spirits! I will make some for Red Ted next year and find a story about them too. WONDERFUL! 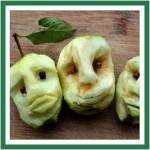 Thanks for featuring the shrunken apple heads Maggy. I have found lots more lovely ideas here too. I know what I’ll be doing today 🙂 and it’ll probably involve owls, leaves, conkers or all three! Pleasure Lily and glad you enjoyed the other crafts too!!!! Loved your heads. So fun, especially the roasting bit! !